Tasmanian boat builder Ned Trewartha at the Shipwright’s Village at the 2015 MyState Australian Wooden Boat Festival. In a large shed on the banks of the D’Entrecasteaux Channel in southern Tasmania, a traditional boat builder uses the old methods and rare materials to craft small boats of exquisite finish. Some argue that these boats are as much art as functionality and Ned Trewartha does tend to blur the line between the two. Christian Willing is the proud conservator of the 10-foot wooden boat ‘Talisman’. He was good enough to share some photos of what he describes as a ‘museum quality’ New Trewartha boat. ‘Talisman was built in 2014 by Ned Trewartha at Gordon, Tasmania. The brief was to construct (as much as reasonably possible) a boat of museum quality. The dinghy is for display only – it will not go into the water. Talisman is built to a design by Battery Point shipwright and boat builder Bill Foster. Ned makes more than gorgeous boats, he’s also an artist and luthier (a craftsman who makes stringed instruments). His favourite form is the ukulele, traditional instrument of the Hawaiian Islands. Ned prefers to call his ‘euculeles’ as a nod to their Australian provenance. Photos by Kim Rodahl. Read more at nedtrewarthawoodenboats.com.au and don’t miss Ned’s video interview with film maker Joe Shemesh on the AWBF News Blog here. Windeward Bound Needs a Mate! 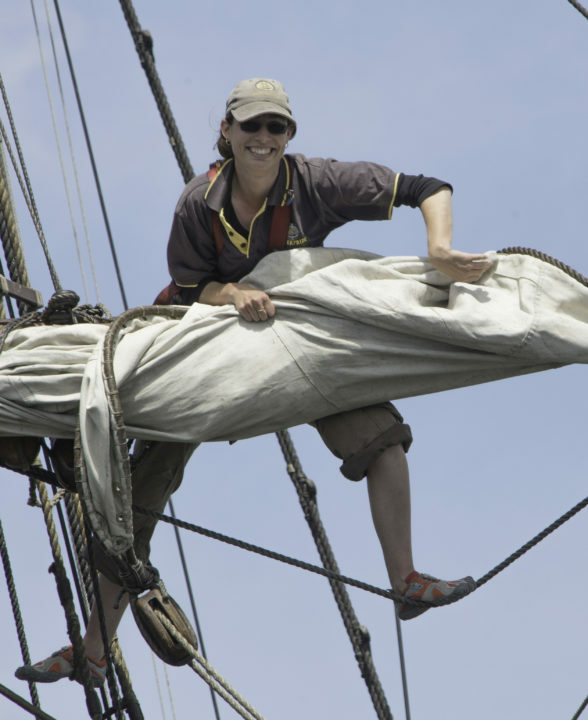 The Windeward Bound Trust is very excited to announce a new, full-time, salaried position of First Mate aboard the brigantine Windeward Bound. This non-liveaboard position offers award benefits, above-award salary, and professional training and development opportunities. It includes periods of maintenance and daysailing from our home port of Hobart, as well as regular sea-going voyages throughout the year. This position combines traditional First Mate duties with a focus on our award-winning youth development programs. The ideal candidate meets all of the below minimum requirements, and has an interest in helping to grow and improve the quality of our maritime education daysails, sail-training voyages, and our maritime volunteer and scholarship programs. A full position description and instructions on how to apply are available at windewardbound.com.au. Please note that applications close Monday the 12th of October 2015. Author managerPosted on 15/09/2015 17/09/2015 Categories StoriesTags adventure sailing, Australian Wooden Boat Festiva, Hobart, sail training, tall ships, TasmaniaLeave a comment on Windeward Bound Needs a Mate!